One misty, moisty, very sad morning – a stroll along the Middlewich #narrowboat #england – The Diesel-Electric Elephant Company. Went for an early morning perambulation. Made it useful by taking the rubbish up to the CaRT bins at Barbridge, timed it to be out and back before even the dog-emptiers were about. Got back to the boat only to hear via email from a friend that her mother died overnight, a result of complications following an operation. The circle of life’s a bit of a five-sided squished square, really, isn’t it? Not good, we all know how losing people feels, and there’s nothing I can do to make it feel less rotten. I am not going to be so crass as to offer any platitudes, duck-billed or otherwise. You know what I mean. So what then? A distraction, briefly, with a few images from my morning’s walk, mayhap? Inadequate, I suspect. It was already very warm even at that early hour, and the ducks were cheek by feathered jowl with the roiling mist-demons. Once you’ve seen one canal bridge you’ve almost seen them all, except for the ones that look totally different to the ones that you’ve seen. They all have their own characters though. A struggle between light and darkness? Cool heaven on one side, hot hell on the other? Sometimes the sunlight pokes through just as far as it can, and then stops. 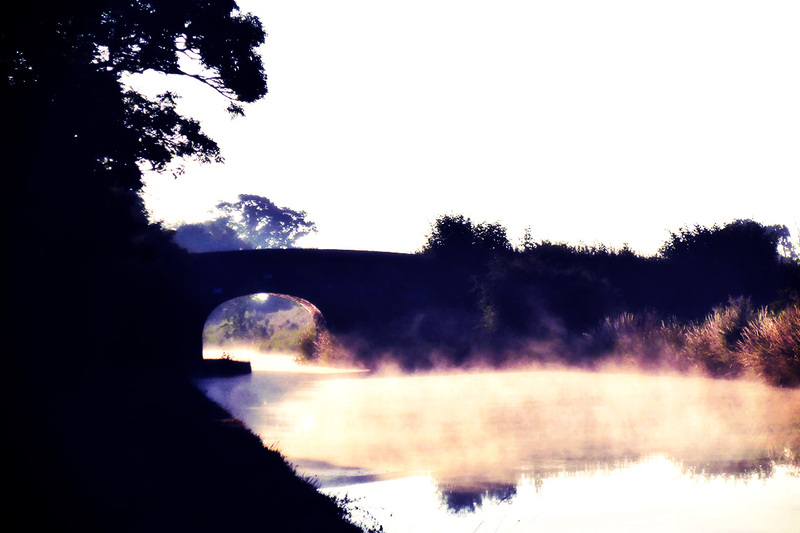 The towpaths are a pleasure to walk on at the moment, after all of this hot, dry weather. In winter they can be nigh-on impassable, neck-deep in mud and oomska. For the moment though, just solid earth, parched grass and the occasional dollop of fox poop or deer poop or sheep poop or rabbit poop or goose poop or duck poop. You puts one foot in front of t’other and you takes your chances. I had high hopes for the local heron this morning, he struck a beautiful pose taking off in a flap backlit against one bridge, but then he disappeared never to be seen again. Back to his caravan in some corner of a field, I suppose. They are horrid creatures really, they eat anything they can get from baby chicks to small children, but I do love seeing the prehistoric-looking monsters flying – like pterodactyls. The “supermarket car park effect” has kicked in again on these moorings. There was a commotion yesterday with an engine going repeatedly into hyperdrive-revs, and when I looked out of the side-hatch to see what the Cardinal was in for there was a boat dancing around his arse-end in some sort of turn manoeuvre. After giving me a rather amusingly aggressive “meaningful” eyeball to eyeball the woman at the helm shouted that she was practising… and then promptly (well, not so promptly…) reversed past and moored up nose to nose, ignoring the hundreds and hundreds of yards of free moorings available – moorings with less about them of the “meerkat huddle” and more about them of “a little personal distance, given in good manners”. Sighs again, just for effect. It’s getting very warm again as I type this – into the eighties of Mr Fahren’s scale and beyond again, I suspect. Still, it’s an ill wind that both sounds like a fart and blows no-one any good, so at least the solar panels are feeding like kings. I have interwebnets at the moment (obviously, otherwise you wouldn’t be reading and scoffing at this nonsense), so Mr Sainsbury has had a comestibles order placed with himself for tomorrow. With luck and with Mr Trolley I’ll meet it in the nearby marina car park, oik everything over the canal bridge and thence along the towpath back to the Cardinal. Then I too shall eat like a king, for a day or four, until the fresh stuff is gone and it’s back to being creative with packets and Lazy Garlic and Lazy Ginger. It’s not all parched and gasping in the countryside, some of it looked quite green this morning. Some of the countryside looks green, some looks parched. It all looks rather splendid though, whatever its condition. The sunny sides of the bridges were warming up again nicely. Good day, Sunshine. Mr Mole has been busy overnight through this bridge and beyond. Me? I’ll be warming up too, juggling the vents and hatches and up and down with the blinds as Mr Sun moves himself around during the day. Laundry, I suppose, I ought to do some laundry – summertime, and the dryin’ is easy, as they say. Fun, fun, fun, ’till daddy takes the twin-tub away. If I were a huggy person I’d say something such as “Hugs, J” but I’m not, a hug is just a monstrous invasion of personal space to me, so I’ll just say instead that I’m thinking about you. Chin up and keep smiling, if for no other reason than I find that it both annoys and confuses the hell out of the rest of our species, and what better reason than that could there be? You there – yes, you! I smile at thee and bid thee and thy potted knees rude health and a very good day. What reply have you to that? None! Take these pleasantries and a pox on all your houses. Fare thee well, if thou darest. Now, be gone out of my sight, foul kin. I wave my hand and wish the demons of well and happy to take you. Pah! My goodness those are lovely pictures. I hope your temporary neighbors are at least quiet. Thank’ee kindly! The neighbours were at least quiet – and being limited to weekends, by the look of it, have now gone! Result! There are three boats on this stretch now including me and we have all used the “men at public urinals” rule for mooring – as far apart as possible! ‘Hug a little duck’ – the world has to remind us we arem’t immortal. I never got such beautiful images with those disposable cameras even with an advanced technique – the point and press! Wonderful! I believe it is the amazing side of photography that those that know would call art and so good to be able to share in it. I hope Mr Sainsbury comes good tomorrow – feast like a King! Ohhh Ian, let me come right over there and give you a big, warm, generous hug!!!!!!!!!!! Wellll, you “asked for it” now didn’t you, with all that going on, about how hugs are horrid…? -grin- Yes you did!!!!!! After feeling sad, for those left behind, let’s dwell on the fact, that we are still alive and still ‘bopping around.’ Even though, more slowly. Because what good does our descent into sadness do? For anyone? “Tough Love” perhaps. But, really, rather common sense too. Simply gorgeous misty morning photo!!!!!!!!!!!!!!! Life is indeed a most peculiar process. By the time you think you’ve understood it someone’s moved the goalposts again.